The U.S. Environmental Protection Agency (EPA) has approved a plan for the clean up of the largest and highest priority abandoned uranium mine on the Navajo Nation. Cleanup of the Northeast Church Rock Mine will include removal of 1.4 million tons of soil contaminated with radium and uranium from a site that was operated as a uranium ore mine by United Nuclear Corporation from 1967 to 1982. Located near Gallup, New Mexico, the mine adjoins the United Nuclear Corporation uranium mill site, a Superfund site managed jointly by EPA Region 6 and the Nuclear Regulatory Commission. At the request of the Navajo Nation, the EPA is using Superfund authority to investigate and clean up the contaminated mine site, in coordination with the existing adjacent Superfund site clean up. Most of the 125-acre mine permit area is immediately adjacent to the Navajo Nation. 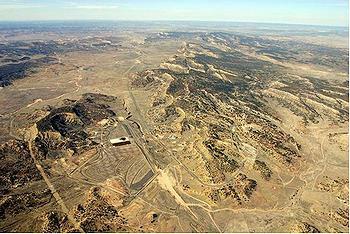 The mine is mostly on Navajo tribal trust land, while the mill is on private fee land. There is a small community of residents who live next to the mine site on the reservation, downstream and downwind of the radioactive waste piles. The residents graze sheep, cattle and horses, and collect herbs around the area.